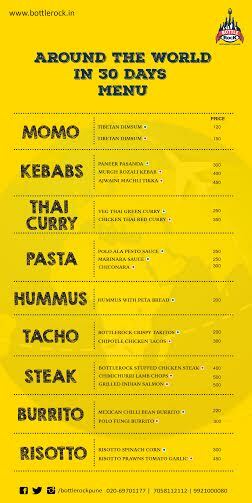 Fit Foodie Megha: Let's Rock - Bottlerock Restaurant and Lounge reviewed! Let's Rock - Bottlerock Restaurant and Lounge reviewed! Bottlerock is a super spacious restaurant and lounge creatively designed with cabanas,beautiful chair and tables with candles in the center. It is easy to locate on the foot of the hills of Sus - Pashan road slightly off Mumbai-Bangalore highway. It is towards becoming one of the most loved lounges in the area for its young crowd, cool ambiance and lavish bar. Bottlerock is a one stop shop for a dinner with family, a romantic date-night or a birthday bash with friends. Ambience:: It has two sections; one is Nisarg, which is for family and other one is a lounge for party goers. I have not been to Nisarg. In the parking only left side is Nisarg and right side is Bottlerock lounge. From outside, you can't define the "mahol" of the lounge. But as soon as you enter, you will be welcomed by neon lights and graffiti, with bottles creatively reused for a funky interior. Several bottles have been used to add to the décor of the place. Don't miss the quirky clock that has been made entirely using old bottles! Cocktails- They were so artistically decorated that one needs to think whether to drink or praise its beauty! Being a non-alcoholic, cocktails are out of question for me to review. Pinacolada- Beautifully presented in the shell of Pineapple. Spicy Girl- A bi-colored drink with perfect concoction of spice and bit sweetness topped with green chilli! Funky Tofi- A coffee and chocolate based drink which was good and not that great! Chicken Dum Kebab- No comment about the taste but it was cooked and served so traditionally that it surely caught everybody's eyes. Nachos Mexicani- Loaded Nachos with cheese sauce, Cabbage was served with sour cream. It was good as far as quantity is served. Nothing attracted me to give it a second chance. Paneer Shola Kebab- Paneer used was really nice. Platter served was colorful with perfect marination and great taste! Dahi ke Kebab- Not more than a bread roll. Stuffing was on a lower side. Taste was good. You can call it anything but kebab. Fungi-de-Pasta- Well prepared cheesy saucy penne pasta dish with mushrooms and olives served with garlic bread. A must try. Mushroom Pahadi- Green colored gravy was mild and freshly prepared. Enough to fill two people. Nargis Kofta- The only dish that disappointed me. I had huge expectations, but was let down. Kofta was stuffed with paneer and fry fruits topped with cherries. Curry was salty and kofta was sweet. So the complete dish was on extreme taste. I would like to suggest chef to taste it before serving. Lachcha Parantha and Butter Roti -Served perfectly. They were prepared like any other place. Sizzling brownie with Vanilla ice-cream- All is well, that ends well. Sizzling Brownie was soo soft and fresh. It had a perfect balance of taste and freshness. 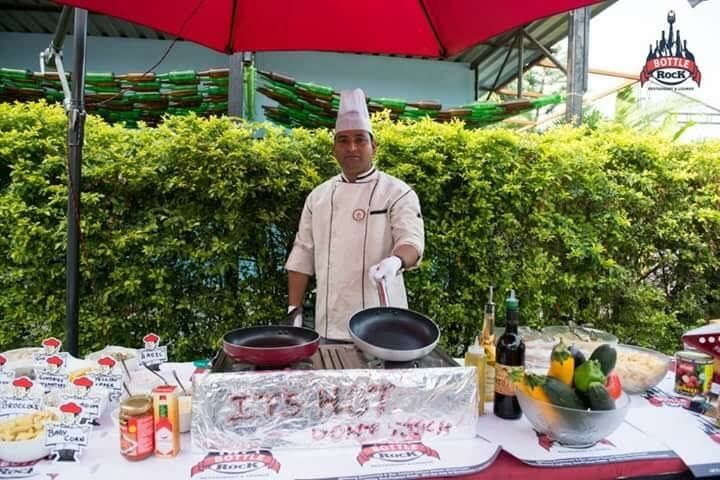 Special mention about the food festival "Around the world in 30 days"organized by Bottlerock restaurant.It had a bit of cuisines of around the world starting from Momos to Kebabs to Thai Curry to Pasta to Burritos. Do keep in touch with them at 020 30162162 to know ongoing events. They are open from 7pm to mid night and sometimes late. Overall, a nice experience. Thank you Sumitro for making this happen!